Bernard is a leading financial journalist and editor with over 18 years experience which includes roles with Reuters, the Financial Times Group and Fairfax Media in Wellington, Canberra, Sydney, London and Singapore. 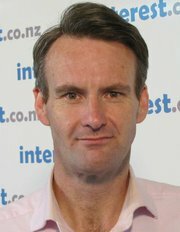 Bernard is currently the Editor of Interest.co.nz, a news and information website aimed at 2 million New Zealand borrowers and savers, and is a commentator on financial, economic and investment issues, regularly appearing on radio, television and in the Herald on Sunday. economic issues, and on-line media. Bernard was heavily involved in the formation of www.reuters.co.uk and managed the editorial businesses at Xtramsn and stuff. He explains his sometimes controversial views in an engaging and refreshing way to a wide audience, and works independently with a completely unbiased view. Bernard speaks regularly on the current economy – what's happening and what it means for you, the credit crunch, interest rates, housing, and financial markets issues.